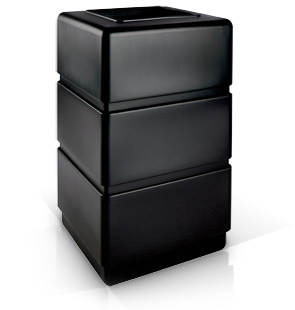 These three-tiered waste receptacles are contemporary, stylish and practical. They have a large trash capacity and will fit into any retail environment. 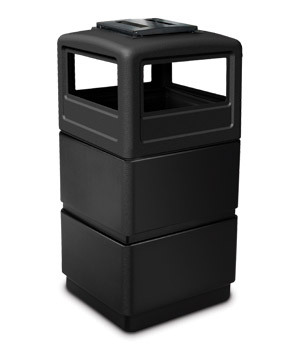 Made of polyethylene, these 38 gallon waste receptacles can be cleaned using a standard degreaser. Three great top options to choose from include an open top (no lid), dome lid (muti-side opening) or dome lid with integrated ashtray. The integrated ashtray provides all in one ash and trash design! Large 38 gallon capacity, perfect for high-traffic areas. DC-732401 - 32"H x 18-1/2"Sq. DC-73250199 - 40.5"H x 18-1/2"Sq. DC-73260199 - 40.5"H x 18-1/2"Sq. These models made from post consumer recycled (PCR) material, 50% PCR content. The ashtray assembley is made from a polyethylene blend with 10% recycled content. All models are shipped in a carton made from 50% recycled content.